Tuesday, July 1st is Canada Day, and Canada needs 9/11 Truth! 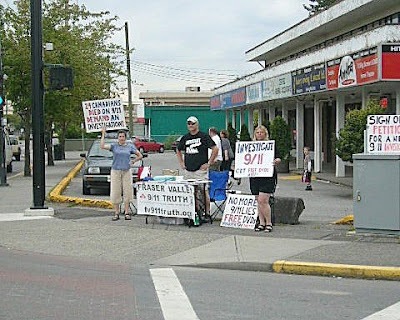 Therefore, this will be a special day of action for Fraser Valley 9/11 Truth as we share what we know about 9/11 with our fellow citizens on the streets of Maple Ridge during the official Canada Day celebrations, and we need as many people out as possible to participate in this act of love for our country, fellow citizens and the world at large. If you can't get out here, please get out in your own cities, towns and neighbourhoods for 9/11 Truth and Justice, and to put an end to the illegal wars that are based upon lies. If you have never taken action before and not normally inclined to do so, please make this the one day that you do something. Put a sign in your window, on the lawn or in your car, make a banner and hang it at an overpass, print and copy some flyers, burn some DVDs and hand them out, but PLEASE do something to help inform Canadians and to save Canada. It is up to each of us to expose the 9/11 fraud and to say to the world that "we do not and will not support the global war of terror and the killing being done in our name without a new, fair and impartial investigation of all the facts!" Our group will be meeting up at the corner of Dewdney and 224th St. in Maple Ridge, BC at 12 Noon, proudly and patriotically serving our country as concerned citizens. Please meet us there or be somewhere in this great land doing the same! Thank you friends in the Fraser Valley and Vancouver area! To be a Canadian is to...To stand by our friends and neighbours in the USA including, those first emergency responders and the 3000 murdered that horrible defining day 9/11/01. Lets not forget the 24 Canadians murdered on 9/11...and for me Id like us all not to forget one Omar Khadr ... A Canadian citizen born in Toronto, he is the youngest prisoner held in extrajudicial detention by the United States and has been frequently referred to as a child soldier. The only Western citizen remaining in Guantanamo, Khadr is unique in that Canada has refused to seek extradition or repatriation despite the urgings of Amnesty International, UNICEF, the Canadian Bar Association and other prominent organisations. ... Did I mention he's a Canadian? If your inclined to banner , hang a sign, or enjoy a moment with a friend or loved one and share the idea that 9/11 truth is what being Canadian is all about! The world is working together for peace through 9/11 Truth, when will the peace activists join us? The outside/in approach is working, keep it up! John Bursill on Mon, 06/30/2008 - 9:30pm.